This topic is based on my experience and observations from the RotU. I hope to be useful to increase the chances of winning for all of you. Basically good guide for all new players on RotU. This is one of two major classes. The main purpose of this class is to provide the ammunition for all players. Simple and practical class, which plays an important role in survival. This is the second of the most important classes in the game. Its tasks are the key to survival, as it heals, heals injured and quickly raises the players. Engineer is a support class. The main task is to put turrets and improve them. Simply, right? Well, in my opinion, the least useful class. It is only a fire support and cannon fodder, but has a fairly practical skills in difficult situations. The Scout is a very specific class that can support the other classes. It relies mainly on its increasing damage dealt, invisibility against zombies and increasing the speed of movement. Also sensational works in the fight against Helga. Class support, which also has an important role. In addition to increasing the damage done to all players a great role in pulling the zombies from the other players. Now that we know the capabilities and responsibilities of each class, we can wonder about their choice and balance. When it is less than 5 players, we should focus on the first two classes (Armored and Medic) and maintain a balance equal to (or +1 Medic) between them. When there is more than 5 players (and kept a good balance and the amount of Armored and Medic) we consider the variety of classes in the game. Definitely the first two classes, which should join the game is Scout and Heavy. Further Engineer and Soldier. Alright! Now we can talk about the game itself. The basic knowledge we should all players have it: the more players, the more difficult to defeat zombies. It not only increases their resistance to damage, but the damage done by them and their quantity. The waves are longer and turrets are less effective. Also it can be difficult for all players to gain Upgrade Points. From now on, the main key to victory is cooperation. It is better to create several lines of defense one point than to separate into groups and weaken the firepower. Later in this thread I will present few ways to create an effective defense. As many of you know, each map has its own spot. Many times I have seen the chaos associated with the defense and placing of the players. Sometimes I saw heroic actions which aggravate the situation. Being honest is mainly for this reason I wrote about this to some players (especially new) explain and show how it works and how you should play the RotU. Weapons, which we use, also has a big impact on the game. Most of the experienced players have a One Shot Kill pistols. They are very powerful and very useful. While the other players often use other weapons. Definitely they should try to gain sniper rifles or bolt-action rifles. In addition to the extraordinary accuracy they have the ability to penetrate, so that one shot can kill a few zombies at once. Also, you should purchase a good automatic rifle. Basic [VIP] H&K UMP is a good weapon, but there are few better weapons. Here now I leave you to choose from and recognition of weapons. If you type this once you can load previous used commands in console by using arrows on your keyboard. (x - is a button used for bind. You can use any button you like). They constitute an important element in weakening and eliminating zombies. When there are not many players are able to effectively eliminate the zombies themselves, but the situation changes when there are more players. They lose their ability to kill, but can still weaken zombies. They are also a good source of gaining Upgrade Points. The most important thing is their good placement. Turret placed in the group of players will not be effective, and as a result it will be wasted Upgrade Points. However, sometimes, when one player defend position placing there own turret can result in a large amount of Upgrade Points. Another practical way to use turrets, is set all the turrets by all the players in one place. This should not only effectively weaken, but also even eliminate the zombies. You should also remember to place the turret with head. Not only do I have in mind right place, but also not to block the line of fire to other players. Turret is an object, so it will block shots like a wall. Barrels are very useful in some cases. They can distract the zombies from the players, but also to attract zombies to a place. Especially worth to put some barrels with turrets, as extends the time firing turrets in a zombie (ie, increases the damage). It should also have a barrel close to ourselfe - Zombies can sometimes get us from behind. Also same thing as turrets - barrels are objects, so it will block shots like a wall. Like I said before, creating a multiple defense lines is important. When they overrun our defense they will have to do same thing with next one. This buy us some time to survive wave. This simple picture shows how it should look. I know that is not always so simple it looks, but on each map and each spot can apply a similar strategy. Defense A should mainly provide turrets. You also can place turrets only in one place - players choice. If they do not destroy, it will weaken the zombies. 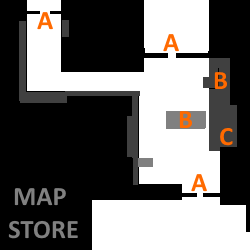 Defense B is defense, where players must try to beat what infiltrated by turrets. However, if the zombies pass it remains the last defense C. If this defense is broken the players are on their own. Those maps are good examples, when defense B can support defense A. Even same thing I can say about defense C. Basically idea of this strategy is to fall back, regroup and counterattack (if you can). But remember! Never get cornered! No escape is worst thing in this game. Always keep eyes on your team and watch your back. Also keep in mind that it is better to leave one of the A defense (or all of them) than to give yourself an escape route cut off, or even to be surrounded. Final Zombies (Hitlers) are quite annoying, but not hard enemies. First of all - weak him/them with some grenades, then shot. One Hitler is very easy to beat, but three of them can make some troubles. It is best to separate them. Don't worry, it's not hard to get their attention. They will follow everyone, who is close to them. Basically just one of the players should "dance" with one of them, while other players will shot from a safe distance. Their special attack is annoying - they're making blast which slow down everyone in range and take away 25 health. Also second special attack can be quite annoying - pink glowing balls, that follow random players. They always make 3 of them, which one can take away 50 health. You can hide for a while by deploying a bubble (if you have some energy). Also if you're near MedKit or Heal Aura you can let one of them hit you. Otherwise, you have to run until disappear. Here comes troubles! The Master (Helga) is comming and her two Final Zombies! - Power Up: Immunity - probably best way to bash them. They can't do any damage, so it's easy to bash them. - Scout Invisible Ability - second best way to bash them. Scout can be invisible to all Zombies, so it's easy for Scout to get close enough. - Bubble Bashing - this strategy is hard, but it can be effective. First of all you need some energy. Make them run in your direction, deploy a bubble and bash them, while they'll stop near it. - Useful Death - one of my favourite strategies. One or two players should go to a good spot and get killed by Zombies. Other players should make run Zombies near downed players - they will bash them. 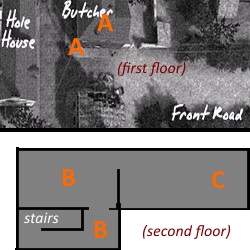 On a few maps it's possible to glitch them (like stairs on map Store), so they'll run in one spot. After bashing them one player should keep Hitlers away from Helga and keep "dancing" in one place, while other players should take care of Helga. Also is good to keep some backup against Helga (keep hiding), 'cause if everyone is dead the only hope will be survivors. Same thing with Hitlers - good to have one backup there too (if there is more players). If Helga is dead, then it's time for Hitlers. Energy can be very useful. Mainly 'cause of deploying bubbles. Bubbles can hide players from Zombies and protect them from any damage inside. It's not only useful against Helga, but also for reviving players. Also waves like Mixed Zombies or Final Wave are hard, so it's good to have some Energy for them. Also remember - bubbles are objects, so they'll block shots like a wall. Key to survive and important thing in this game. First of all, remember that Zombies can kill you, while you're reviving player. It's good to hide in bubble for this time. Also remember that Medics can revive much more faster and they'll be invisible for zombies while reviving (but not always! ), so let them do their job. Also Scouts are good in reviving players, 'cause they can hide from Zombies for a time and also by using their second ability, which increase their movement speed. If someone is reviving protect him! Take away Zombies and let him finish his job. So like I said before - keep your eyes on team and don't let anyone die. And don't get annoyed by not been revived while hard waves - sometimes it's a suicide to do this. Not many players are using Third Person View to play on RotU, but if you're one of those players here's some tips. First of all if you want to activate Third Person View open quick commands (V) and press 5. Now here's some basic knowledge about this view. First of all you can see much more around you and infront of you. This may be very helpful to maneuvers between Zombies. Next thing is crosshair. If you're shoting horizontal it's pretty accurate, but things getting changed if you're shoting up, down, while moving or with lean. Shoting while these positions will need a lot of practice, 'cause bullets will be shoted in different spots than crosshair shows. Basically crosshair is just showing something like a camera position. Next thing is fact, that your body will block your view. It's quite annoying, but after few hours of playing in this view it's not that much. When you stand or crouch your view will be blocked, but if you go prone, go foward, left, right or lean you'll see much more. Next thing are weapons. It's important do get a good weapons for playing this view. Weapons like MG-34 are really great in Third Person, but you have to learn, how to aim, 'cause this gun have high kickback, so bullets in full auto will be shoted over the crosshair. Weapons like Merrsonn are pretty accurate, but they are hard to control. Sniper Rifles are useless in Third Person. They zoom in, but that's mean you'll less see (you'll zoom your body). But Bolt-Action Rifles are pretty good. Very accurate and they gives perfect zoom for this view. Also pistols are better to control in this view. And probably last important thing - always Aim Down Sight, while using non-extraordinary accuracy weapons! Remember, it's a First Person Shooter, so Third Person is only an addon for this server. Anything else about this view is practice. For now it's all! Let me know what are you think. Also let me know if I should add something or edit anything here. I have only hope that this will help you survive and enjoy the game. x being whatever key you want. Oh, I didn't add that about Medics - my mistake. About bind for drop weapon - it doesn't work for me. :V IDK why. Uh this is great! Thank you West!